This year’s Brick Race event on Saturday, June 6th, challenges contestants of all ages to build a racecar using a standard building brick, wheels and lots of ingenuity to cross the finish line. 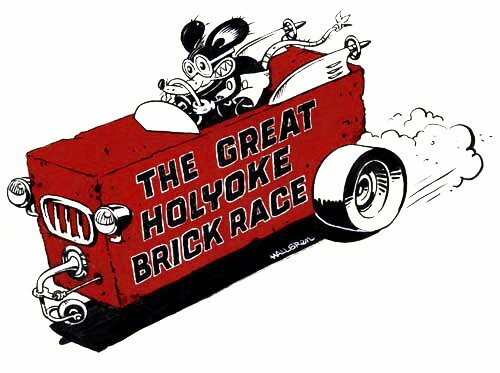 The first Brick Race in 2011 had 30 enthusiastic racers and over 100 spectators from all over the Pioneer Valley. This festive community celebration was such a success that it has become a yearly tradition in the heart of downtown Holyoke! As a sponsor, you’ll help bring the diverse community of Holyoke together for a fun and festive event, while supporting local artists and encouraging the renewal of the historic Canal District. Please consider making a $50 contribution to celebrate the creative and artistic community in Holyoke. All sponsors will be acknowledged on the Brick Race poster that will be prominently displayed and available on race day. Note that any company or person who provides goods or services to the Brick Race valued at $50 or more will also be acknowledged on the poster. Sponsor information: The poster acknowledgement will include the name of the business or individual sponsor along with your business address, phone and email, up to a total of 15 words in length. Please write the text below that you want printed or provide us with your business card for the information you’d like to have appear on the poster.